Everyone wants what’s best for their pet just like they do for themselves and their loved one. We always go for the most exceptional pet foods to enable our pets develop and maintain good health. We create a budget for our pets because we see these furry friends (especially dogs and cats) as important members of our families. So, how can we pick out the most nutritious foods for our pets? If you are a regular shopper you’d notice that there are thousands of pet foods available in the market today, we are always faced with the challenge of choice. If only animals could speak it would be really easy, However, since they don’t, we would like to help narrow down your options to two amazing, tested and trusted brands of pet food. Ever heard of the popular Purina One pet food brand? or perhaps you have seen the meticulously packaged Pedigree pet food products? If yes, then you may have seen the gold mine of pet foods. Stick with us as we explore the nitty-gritties of these two wonderful brands. Purina One dry dog food recipes have 31.6% protein whereas the Pedigree dry dog offers 24.9%. For wet dog foods, Purina One provides about 45.3% protein while Pedigree contains 41.5%, giving Purina one a major lead. More so, only Purina One has dry and wet cat food recipes. The Pedigree pet food is slightly cheaper across all meal type when compared with Purina One. The Purina One brand has 25 dry foods recipes and 27 wet dog foods recipes while Pedigree has only 10 recipes for dry food but dominates the wet foods chart with 41 recipes. Purina One has 14 dry dog food recipes, 12 recipes for wet dog foods and 3 recipes for dog treats while Pedigree offers 10 recipes for dry dog foods, 41 recipes for wet dog foods and no recipe for dog treats. For the feline creatures, the Purina One brand offers 11 recipes for dry cat food, 12 recipes for wet cat foods and none for cat treats. Pedigree does not offer any kind of cat food or treat, this gives Purina one the higher advantage as the most flavored brand. Purina One as a brand has been recalled only once whereas Pedigree has had two recalls since its inception. From the table above, we can see that the Purina One brand has 5 different food types with a total of 55 recipes for both dogs and cats. On the other hand, Pedigree has only 2 food types with a total of 51 different recipes, all for dogs. Also, it’s important to note that both brands do not have any treat for cats and only Purina One provides treats for dogs. However, it is safe to say that they both have a wide variety of recipes. Nutritional values are the principal elements by which all food types are categorized. Certain nutrients are required in high quantity, while some are only required in small quantities and even as micronutrients. Our pets have a sensitive biological system which often requires a reasonably balanced diet in order to grow, develop, and maintain a fairly constant internal environment; immune to diseases and other health problems. If you want a healthy and a happy pet, pay close attention to your pets’ nutritional requirements. Although pets of same specie and breed might have similar nutritional requirements, every pet has its own peculiar needs as their body system might function differently because of varying environmental factors, genealogy, etc. The nutritional values of pet food are presented in form of a guaranteed analysis found on the label of the products as enforced by the AAFCO. The analysis usually must provide guaranteed percentages of crude protein and crude fat, and maximum percentages of crude fibre and moisture. Let compare both brands based on their nutritional value. Why do our cats and dogs need protein in their diet? Does higher protein percentage mean a better pet food product? Protein is the main macronutrient which supplies the essential amino acids required to sustain life, especially in dogs and cats. Protein can be gotten from different source, either plant or animal origin. Every pet diet must contain protein at minimum or maximum requirement, but each pet will need a certain amount to live healthily. Different pet food brands usually have different protein percentages, however, it’s important to check out their different recommended feeding amounts so as not to under feed or over feed your pet with protein. Every balanced diet must contain fat, in fact, a minimum of 10% fat must be guaranteed by every pet diet. Why is fat so important? Common opinion says fat is unhealthy, but this is not the case for pets. Fat is essential for the proper growth and development of our pets. It provides energy and control water loss through the skin of your pets. Fats also aid in the absorption of some vitamin as well as the maintenance of a shiny and healthy skin coat in dogs and cat. Fat gives taste as well as flavor to every pet food. Do our pets really need fiber in their diet?The answer is yes. Just because our pet can chew on almost everything doesn’t mean it is healthy for them. Many times, our pets encounter problems of indigestion resulting from the foods, treats or particles of things they ingest especially while playing or out for a walk. Fibers are components that assist digestion in the small intestine till the food particles are pushed into the large intestine where it is acted upon by bacteria present. It is an important requirement of the digestive system. It also maintains optimum levels of good bacteria and promote the proper functioning of the gut. There is really no significant difference between the crude fiber content of both brands. No healthy diet is complete without the presence of water. The moisture content of every pet food influences the percentage of other ingredients as well as the protein, carbohydrate and fat content. Water is essential for the proper functioning of the body and it helps in eliminating body wastes. To regulate the body temperature, transport nutrients throughout the body as well as prevent dehydration, our pet need water in varying amounts inevitably. Some amount of water can be found in wet and dry pet food, however, pets always require additional amount of water to meet up with their body requirement. As much as we want the best for our pets, the cost of the pet food brand may become a determinant factor especially for pet keepers who are on a fixed budget. Given the variety of brands and dealers in the market place, keeping track of the prices of the various products of your favorite brand could be a hard nut to crack. Looking at the price tag of different products would only tell you the product cost, but you cannot really use that as a basis for comparison. To compare the prices of pet foods from different brand, it is more accurate to use the average cost-per-kcal metrics. This is advisable because it tells you the average cost of pet food exclusive of its water content (dry matter basis). However, you might still want to use the average cost-per-lb which gives you the cost of the food with its water content inclusive. It is observed from the table above that both brands are considerably cheap, yet the pedigree brand is cheaper by all metrics than the Purina One. Purina One and Pedigree are two great brands and their pet foods are known for exceptional quality and incredible taste. Ever wonder why your dogs or cats can’t get enough of these brands? Each brand owns its distinctive flavor and ingredients that makes every chunk irresistible for your pet. This is a catch for pet owners because different pets are attracted to different flavors. As a pet owner, you should know which flavor or flavors appeals to your pet, but you should not be afraid to try out new flavors and explore different available options. Pedigree pet foods equally contains so many ingredients such as ground yellow corn, meat and bone meal, corn gluten meal, beef, natural poultry flavor, fructose corn syrup, tomato pomace, wheat meddling, iron oxide,brewers rice, salt, caramel, wheat flour, wheat gluten, vegetable oil, chicken by-product meal, ground whole grain, lamb, dried plain beet pulp, vitamins and minerals. All these different ingredients put together in the appropriate amounts produces the different flavors that the brand is known for. Purina One pet food is formulated with a wide variety of ingredients such as chicken, oat meal, ranch raised lamb, whole barley, brewers rice, poultry by-product meal, whole grain wheat, whole grain corn, soy flakes, canola meal, ground wheat, turkey by-product meal, pea fiber, soybean meal, fish meal, carrots, peas, spinach, sweet potatoes, chicken stock and broth, garlic oil, liver flavors, carrageenan, guar gum, locust bean gum, glycerin, caramel, poultry broth, sun flower oil, vitamins and minerals. With the number of ingredients listed above, one can only imagine the variety of flavors the brand offers. This brand manufactures dog foods and was originally found in 1957 by Forrest Mars. It was initially branded as “Chappie”in the 19th century when it was found but it is now called Pedigree. It is presently owned by a subsidiary of Mars Incorporated, headquartered in McLean Virginia, United States. The brand slogan has changed severally over the years, from “Top Breeders Recommend it” to “We are for dogs”. The brand offers a wide range of product such as the Pedigree meaty ground dinner, Pedigree healthy longevity food for dogs, Pedigree choice cuts in gravy, Pedigree active food for dogs, Pedigree adult complete nutrition for dogs, Pedigree little champions grilled sauce flavor, Pedigree little champions chunks in gravy, and others. This brand manufactures both dog and cat food. It was found in 1986 and introduced as Ralston Purina’s first premiere pet food. It’s owner from 2001 till date is the Nestle Purina PetCare, a subsidiary of Nestle. It has its company headquarter in St. Louis, Missouri with a worldwide distribution network. The top ingredients of this brand are chicken, whole grain corn, corn gluten, soybean meal, meat and bone meal and animal fat. Chicken and corn are the brands primary source of protein and carbohydrate respectively. The first product by this brand is the Purina One Natural Blends which uses only natural ingredients. Others include Purina One beyond white meat, chicken & whole oat meal recipe, Purina One smartblend sensitive systems, Purina One smart blend lamb and rice formula, wholesome chicken and brown rice entrée tender cuts in gravy, wholesome turkey and barley entrée, wholesome beef and barley entrée tender cuts in gravy, and others. Companies make scheduled recalls on products that may have a foreseen defect or safety issues. The importance of a recall is to conduct further safety tests in order to effect changes to the product to ensure that it is safe for use. This brand has only been recalled once, but the problem has been fixed and the brand is back in the market. However, some pet owners believe that a voluntary recall was issued in mid-2016 but till date no recall-associated problem has been recorded. 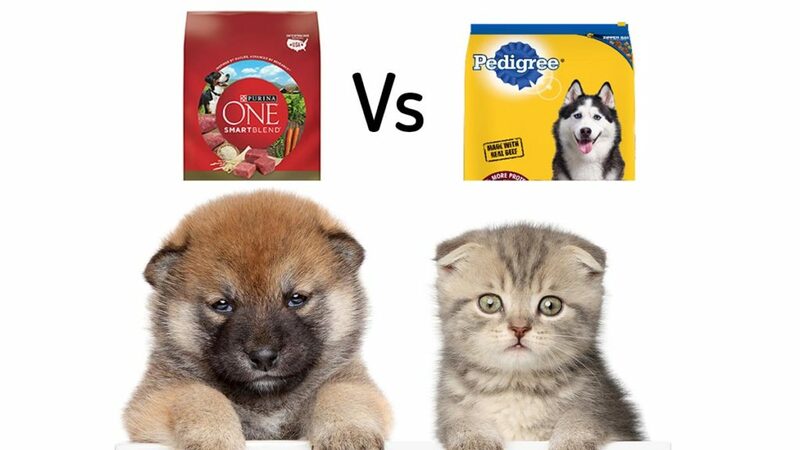 It has been a tough competition between both brands, but it’s safe to say that Purina One is the winner as it is seen to have dominated in protein content and fat content whereas Pedigree stands out as the cheaper brand. Purina One obviously has a lot more flavors for both dog and cat foods and has had less recalls than Pedigree which offers only dog food, however, both are great brands and offer great nutritional values for pets.